Founder of Hospital Heroes, LLC. I’m currently a junior at Molloy College, pursuing my bachelor’s degree in Accounting with a minor in New Media. In my time at Molloy, I co-founded the Entrepreneurship Club after discovering my passion for inventing things and building businesses. 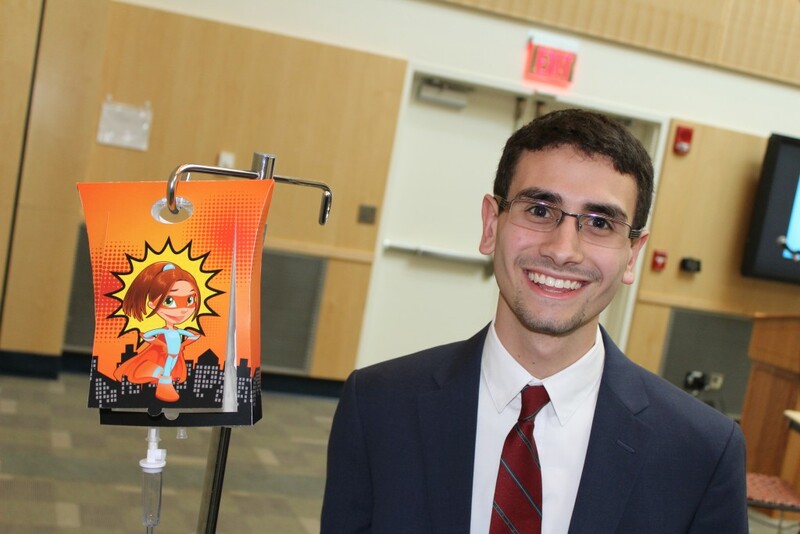 Since then, I have been developing one idea after another until my latest invention, IV Hero, a sleeve that covers an intravenous bag during treatments and is designed to make hospitals a less scary place for kids. Each sleeve is decorated with superheroes, transforming what was once an intimidating medical procedure into a creative opportunity to gain superpowers. How did you get the inspiration for IV Hero? I was reading an article about pediatric patients, and how they were so terrified of CAT scans and MRI machines that they actually needed to be fully sedated just to go for a scan. This was causing a number of issues, not to mention a huge deal of stress on the patients and their families. Rather than re-engineer these machines, a few folks from GE put big stickers up on the machines that made them look like submarines and pirate ships. What was once making kids cry, was now making them want to come back; they thought it was a ride at an amusement park. I thought this idea of transforming a scary experience for kids into a fun and exciting one was such an amazing way to reimagine the hospital experience, and I really wanted to focus on transforming everyday procedures that kids are put through. IV bags are a staple of the hospital room, and thus, IV Hero was born. My first thought of VE is how big of an eye-opener it was for me at such a young age. So many high schoolers just go through the motions in high school with their goals set to the future that they don’t fully utilize some of the programs at their disposal – I know because I was like that. When I began VE, it really broadened my horizons on how the business world works and I was offered the opportunity to begin building my professional persona, which gave me a huge advantage when I got to college. By far, my favorite part of VE was being a part of the presentation team for my business. We were awarded 3rd for the region, and it felt so satisfying to put so much effort into our presentation and really have those efforts be recognized. When I was in VE, I was the Vice President of Accounting, which ultimately helped me to form my decision on majoring in accounting. In addition, being a part of the presentation team really helped me to become a better public speaker which comprises so much of what I do today. Whether I’m speaking in front of an audience, to investors, at business competitions; being able to speak concisely and professionally is something that I have to do every day, and I can attribute that to my experience in VE. Do you believe that your VE experience was a differentiator in helping you start with IV Hero? VE helped me to think differently. The environment really allowed me to explore my creativity within my VE firm, and that stuck with me as I entered college and began to meet like-minded people who enjoy inventing things and building businesses. With my creativity and my background in public speaking, I began entering and winning business plan competitions which set me on this path of becoming an entrepreneur. Don’t let people tell you that you can’t do something, or that your ideas will never work. If you’re passionate about something – do it. You never know where that idea will take you or how it will help you grow.